Engaged? How cute is this? This piece includes 3 different sizes of round discs, one heart charm and one large puffy heart plus your choice of chain. If you prefer to change the shape please just mention it when checking out in the "notes" section. Our necklaces are shipped in a pretty drawstring organza sash for easy gift giving. **Please make a note when checking out if you would like something different on the discs and which chain you would like. Standard chains are 18". ***Need more pieces? No problem, just click "contact" on the left and we will make a special listing just for you if you need more. I buy all of my charms from here!! Amazing to work with and wonderful products!! Thank you Wendy. It’s perfect. This is one of the greatest gifts I have ever given! Christmas cannot come soon enough!!! This turned out so great!!! Thanks so much!! I will be recommending you to everyone I know!!! Now I cannot wait for Christmas!!! Please note that we don't send invoices with the shipments, your credit card receipt is your invoice or you may also print one if you log into your etsy and look under purchases you will see all the items you have purchase. . If there is a problem with your order please contact us within 3 days of receiving your order. Gemz & Jewelz strives to meet the expectations and full satisfaction of all our customers. We are not able to provide refunds on "custom" orders. If the error was our mistake, we will fix it immediately and will refund the return shipping fees. If the error was not our mistake, and you are simply dissatisfied with the product, then the piece is yours to keep. 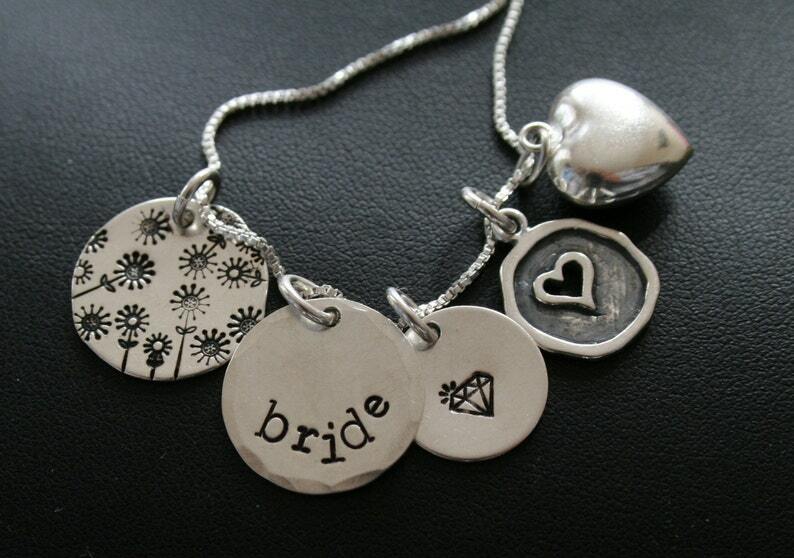 We reserve the right to judge our own quality, we do our absolute best to send out the highest quality of hand stamped jewelry. We cannot remake an order without the original piece returned. We ship First Class mail USPS unless otherwise requested. If you need Priority Mail, please contact us and we will set up a reserved listing for you. Orders will be shipped to 'Pay Pal addresses only' so please make sure that you have the correct one. If you need us to ship to another address please contact us before placing the order. We arent responsible for any damage, loss or delay cause by the postal office or shipping companies. Insurance of your shipment is available at extra cost, please let us know if you want to insure your package. To clean your piece we recommend using a polish cloth that is safe on sterling silver. Also, we sell "polish PADS" that can remove any lotions, soaps, hairspray, etc on our website. These little pads are amazing and last a long time. All sterling silver naturally tarnishes, and there are many different factors that make this happen..climate, lotions, etc., that might cause your piece to tarnish faster than others. We sell "polish PADS" on our website that remove the tarnish easily. Please read STORING below to avoid tarnishing. Storing your piece in an airtight plastic baggie, in your jewelry armoire or a dresser drawer (NOT on your dresser) when not worn will also help.